The persistent load-shedding that affected several parts of the country for nearly a month will be no more by the end of today, the Energy, Water and Sanitation Authority has said. The regulatory agency said repair works on the Jabana substation, where damages to installations and vandalism has led to power supply disruptions, was successfully completed yesterday. 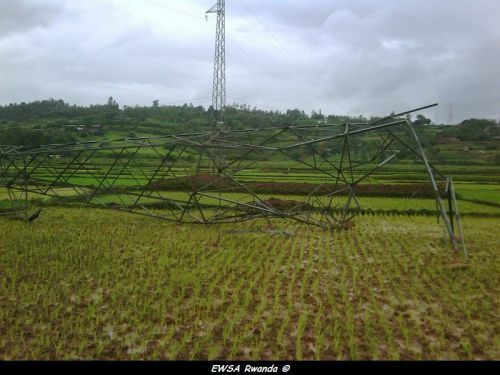 EWSA said, last month, that power disruptions, which began on March 19, were due to the collapse of two 110KV towers transmitting power from the Jabana substation to the main substation in Gikondo. The towers succumbed to heavy rain, while they had also sustained immense damage caused by vandals, who broke pieces of steel from them. “We have delivered as we had promised. All works are complete and the load-shedding that affected homes and businesses due to the failings of Jabana will be no more,” Prosper Mubera Birori, the head of public relations and communication unit at EWSA, told The New Times yesterday. “It took us a lot of manual labour and money and we are glad it is over. We began a countrywide inspection of all electricity pylons and stations to ensure that they are in shape and that the challenges we went though over the last few weeks do not happen again,” he added. The damage cost EWSA 30 mega watts per hour through the electricity lines and although it had estimated to spend about Rwf6 million on repair works, the cost skyrocketed to over Rwf50 million, he added. “We worked day and night to ensure that electricity is restored, and up to now we are still working,” Simon-Pierre Habyalimana, the in-charge of Electricity Trasmission Unit at EWSA, said. 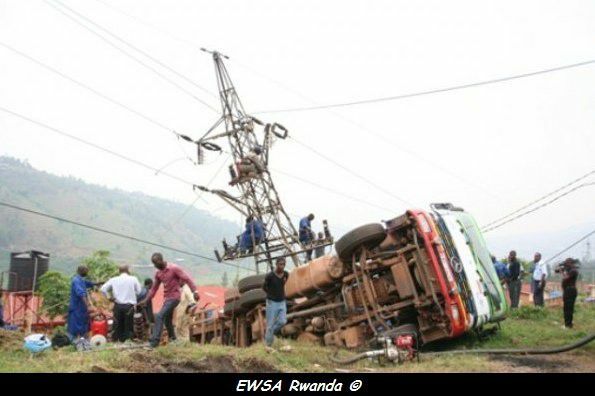 “EWSA could have made Rwf84 million if the power was running in the last three weeks. This is a huge loss and we shall work hard to ensure it doesn’t happen again,” Habyalimana said. This morning, on Twitter, EWSA said "Everybody should fight against those who destroy and steal EWSA's infrastructures. Your collaboration is needed. Thx." In recent weeks, Kigali residents have been complaining about the poor performance of the Energy and Water Sanitation Authority (EWSA), especially recurring power blackouts, but also water supply problems. Though there have been problems before, the last two days saw areas like Kicukiro and Kanombe being hit by power cuts of more than five hours, and in some neighborhoods even the entire day. 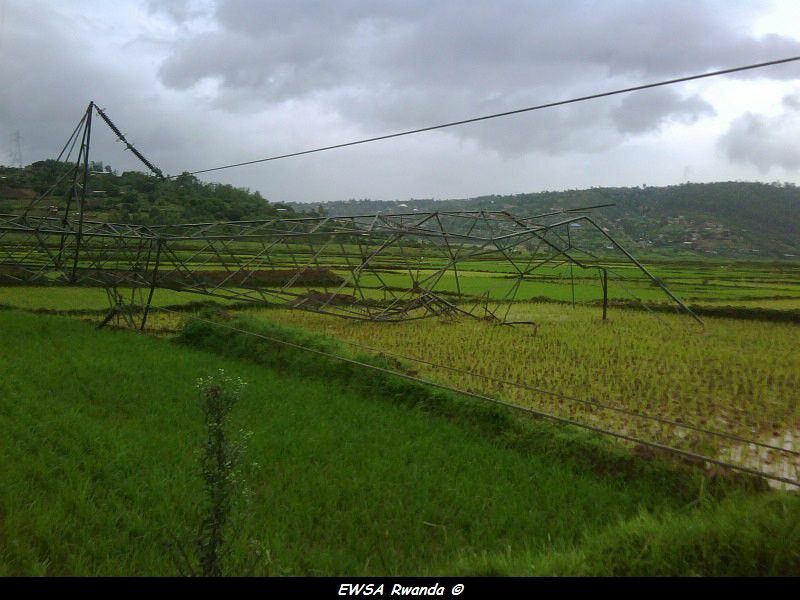 "The power cuts were due to parts stolen from two masts which resulted in them falling over," explained EWSA DG Ntare Karitanyi on Thursday. "The stolen parts include pins and screws, and when the heavy rains and wind occured, the masts collapsed." The incident occurred in at Jabana-Gikondo substation (in the marshland near Kabuye sugar factory) and the masts in question are high-voltage ones of 110 Megawatts. According to the official, it will take time for the problem to be fixed as it is in a marshland where it takes longer for the new foundations for the masts to dry. "Meanwhile, we have been able to connect some areas to other lines while, but this is not possible everywhere so those areas will have to wait for some more time for the masts to be fixed," said Robert Nyamvumba, deputy-DG in charge of energy. Karitanyi urged people in their own interest not to touch any EWSA equipment. "Rwandans have to change their mindset and remember that they are the first beneficiaries of public infrastructure, so when they steal parts from a mast in their neighborhood they will themselves suffer from the power blackouts." Concerning brief power cuts which sometimes leave electronic equipments damaged, Karitanyi said that in such cases people have to inform the nearest EWSA station so that a technician can determine the source of the damage, and if it is due to a power cut, the insurance will pay. "Many people still ignore that but we really pay for the damaged equipment," he said.